The Terrifics #6 Review – AiPT! 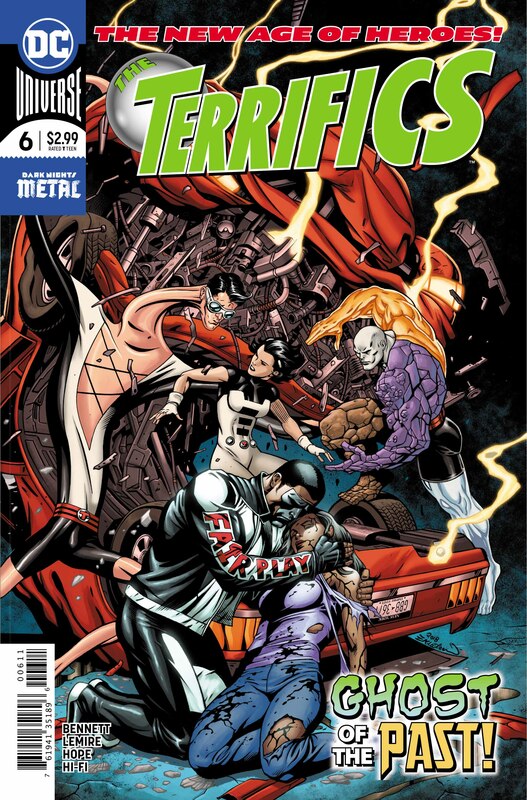 The Terrifics have to fight a town made like Metamorpho. How will they beat this?! And who is Doctor Dread?! The panelling work in this issue by Joe Bennett continues off the same way that was started by Shaner in the past two issues. Each page is split into four with a quarter each for Mister Terrific, Phantom Girl, Plastic Man and Metamorpho. It’s a really well done concept as it allows each character to appear in equal footing on every page while also not missing out on pages from the perspective of each member. When two or more members of the team meet up, their panels combine in order to show they’re interacting as well as giving more room for the artist to work. The art by Bennett is pretty good overall but my only real problem with it is how monsterous Plastic Man looks when he’s changing shape — that’s mainly due to how Bennett has a style that works best on more realistic and grounded looking situations or monster/horror books. The story by Lemire is great as usual, setting up that the events were concocted by the villainous Doctor Dread so he can get to MILLENNIUM CITY in order to get to TOM STRONG before the Terrifics can. I really, really, really enjoyed seeing the last page with the shot of Millennium City as I’ve been excited for Tom Strong to appear ever since he was announced to be a part of the series and now I honestly cannot wait until next month when we finally get to see him! Another really fun issue that finally pushes the story to reaching Tom Strong! The writing by Jeff Lemire is fantastic again. The reveal at the end of the issue is great! ... Except for Plastic Man who ends up looking kinda monstrous.